My daughters just shared an article with me from Epicurious, by food writer Lauren Salkeld. The topic is lucky foods for the New Year. We're getting together for dinner on New Year's Day, and they thought we might want to build the meal around some of these foods. Fun idea, don't you think? While traditions vary from culture to culture, they do share some similarities: The most common categories of foods are grapes, greens, fish, pork, legumes, and cakes. Read on to see how the world encourages a year of luck and for a terrific recipe to get your year off to a great start. Grapes: Folks in Spain eat twelve grapes at midnight-one grape for each stroke of the clock. This dates back to 1909, when grape growers in the Alicante region of Spain initiated the practice to take care of a grape surplus. The idea stuck, spreading to Portugal as well as former Spanish and Portuguese colonies such as Venezuela, Cuba, Mexico, Ecuador, and Peru. Each grape represents a different month, so if for instance the third grape is a bit sour, March might be a rocky month. For most, the goal is to swallow all the grapes before the last stroke of midnight, but Peruvians insist on taking in a 13th grape for good measure. 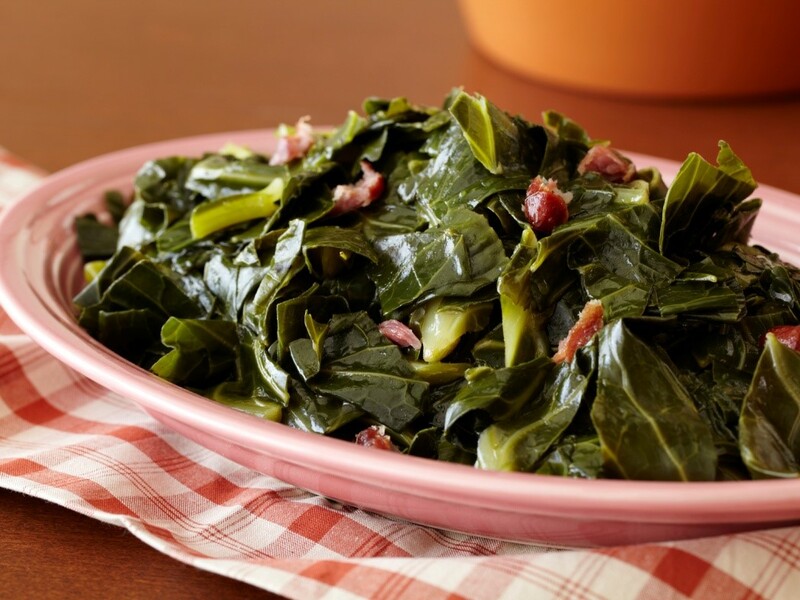 Cooked Greens: Cooked greens (cabbage, collards, kale, and chard) are consumed on New Year's day for a simple reason-their green leaves look like folded money, and are thus symbolic of economic fortune. The Danish eat stewed kale sprinkled with sugar and cinnamon, the Germans consume sauerkraut, and in the southern United States, collards are the green of choice. It's widely believed that the more greens one eats the larger one's fortune next year. Legumes: Legumes, including beans, peas, and lentils, are also symbolic of money. Their small, seed-like appearance resembles coins that swell when cooked so they are consumed with financial rewards in mind. In Italy, it's customary to eat cotechino con lenticchie or sausages and green lentils, just after midnight-a particularly propitious meal because pork has its own lucky associations. 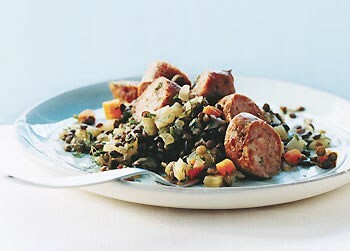 Germans also partner legumes and pork, usually lentil or split pea soup with sausage. 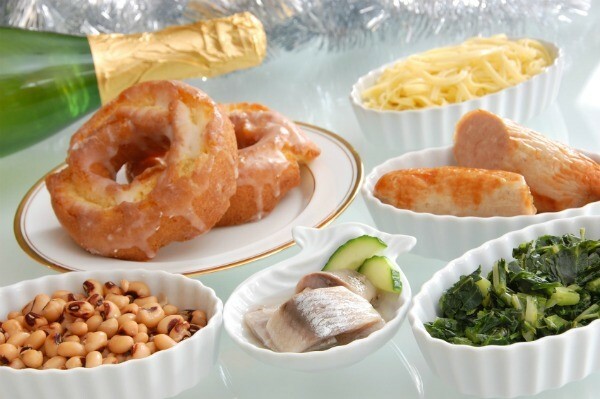 In Brazil, the first meal of the New Year is usually lentil soup or lentils and rice, and in Japan, the osechi-ryori, a group of symbolic dishes eaten during the first three days of the New Year, includes sweet black beans called kuro-mame. 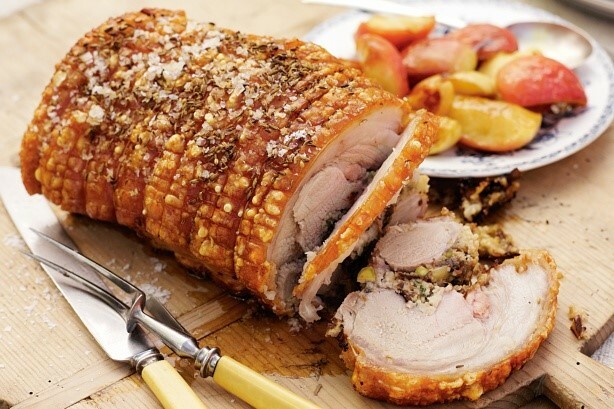 Pork: The custom of eating pork on New Year's is based on the idea that pigs symbolize progress. The animal pushes forward, rooting itself in the ground before moving. Roast suckling pig is served for New Year's in Cuba, Spain, Portugal, Hungary, and Austria-Austrians are also known to decorate the table with miniature pigs made of marzipan. Different pork dishes such as pig's feet are enjoyed in Sweden while Germans feast on roast pork and sausages. Pork is also consumed in Italy and the United States, where thanks to its rich fat content, it signifies wealth and prosperity. Fish: Fish is a very logical choice for the New Year's table. According to Mark Kurlansky, author of Cod: A Biography of the Fish that Changed the World , cod has been a popular feast food since the Middle Ages. He compares it to turkey on Thanksgiving. The reason? Long before refrigeration and modern transportation, cod could be preserved and transported allowing it to reach the Mediterranean and even as far as North Africa and the Caribbean. Also, Catholic Church's policy against red meat consumption on religious holidays helped make cod, as well as other fish, commonplace at feasts. The Danish eat boiled cod and Italians eat dried salt cod. Herring is consumed at midnight in Poland and Germany. Germans also enjoy carp and like to place a few fish scales in their wallets for good luck. The Swedish New Year feast is usually a smorgasbord with a variety of fish dishes. In Japan, herring roe is consumed for fertility, shrimp for long life, and dried sardines for a good harvest (sardines were once used to fertilize rice fields). Cakes, Etc. Cakes and other baked goods are commonly served from Christmas to New Year's around the world, with a special emphasis placed on round or ring-shaped items. Italy has honey-drenched balls of pasta dough fried and dusted with powdered sugar. Poland, Hungary, and the Netherlands also eat donuts, and Holland has ollie bollen, puffy, donut-like pastries filled with apples, raisins, and currants. 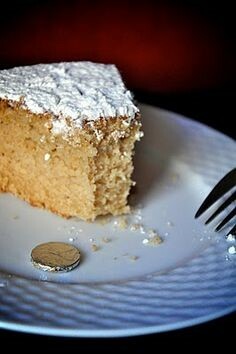 In some cultures (Mexico, Greece, Sweden, Norway) people hide a special trinket or coin inside a cake-the recipient will be lucky in the New Year. Swedes and Norwegians also hide a whole almond in rice pudding-whoever gets the nut is guaranteed great fortune in the new year. 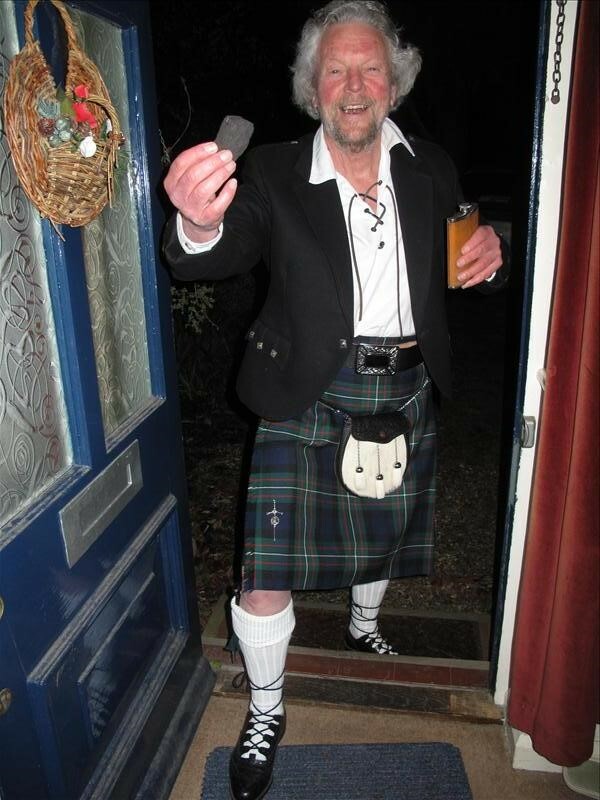 Finally, in Scotland there is a tradition called "first footing," in which the first person to enter a home after the New Year determines what kind of year the residents will have. The "first footer" often brings symbolic gifts like coal to keep the house warm or baked goods such as shortbread, oat cakes, and a fruit caked (called black bun), to make sure the household always has food. Now that you know what to eat, there's one more guideline (superstition?) to keep in mind. In Germany and the Philippines it's customary to leave a little bit of each food on your plate to guarantee a stocked pantry in the New Year. The conclusion? Eat as much lucky food as you can, just don't get too greedy, or the first place you'll be going in the new year is the gym. Bring lentils, water, and 1/2 teaspoon salt to a boil in a 2-quart heavy saucepan, then reduce heat and simmer, uncovered, until lentils are just tender but not falling apart, 12 to 25 minutes. While lentils simmer, cut fennel bulb into 1/4-inch dice and chop enough fennel fronds to measure 2 tablespoons. Heat 3 tablespoons oil in a 3- to 4-quart heavy saucepan over moderate heat until hot but not smoking, then stir in onion, carrot, fennel bulb, fennel seeds, and remaining teaspoon salt. Cover pan and cook, stirring occasionally, until vegetables are very tender, about 10 minutes.